Nepal is one of the most beautiful and naturally diversified countries located in South Asia which shares a territorial border with two big countries India and China. The capital city is Kathmandu which is renowned for its archaeological and beautiful monuments, temples, and many more places. Nepal is famous for its exquisite natural scenario and beauty of those iconic Himalayas has added more beauty. It is also famous for diversity in culture religion and geography to visit Nepal. All in all, it is full of varieties of adventure tourism pack. The world’s highest mountain Mount Everest lies in this country which had increased the beauty of all those snow capped mountains. The second richest country for its water resource has also increased the tourism development. River rafting which is known as White Water Adventure is also one of the major attraction in Nepal because of which many tourists are attracted toward our country. There are plenty of wildlife reserves and national parks famous for different animals and birds like one horn Rhino, Danfe (Himalayan Monal), Asala fish and Spiny Babbler which are only found in our country. There are many historical monuments, palace, and temples such as the land of Lord Shiva (Pashupatinath), the birthplace of Lord Buddha (Lumbini) are most famous all over the world. Nepal is also a place rich in culture and festivals as well as language, dance, dress. Many people of different community celebrate and enjoy different festivals in their own way and own style. Each and every month carry a single festival with the purpose of enjoying and making the tourist happy by showing them the culture what they learned from their ancestors. One of the most important aspects of Nepali culture is the religious harmony, respect, and understanding prevailing among all the religious people such as Hindus and Buddhist. 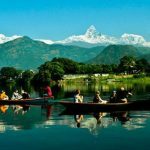 As a tourist, you can choose any months to visit Nepal because it is the naturally diversified country full of natural beauty. But among all those months between October and December will be the best time to visit here because the skies are clean with less rain. The weather is dry during those days and the dryness remains until April. For those visitors who love cold and mountain, January and February will be the best because of cold climate. At the end of spring, u can enjoy the hillside as the rhododendron burst into bloom and you can capture the views of different birds and flowers too. Nepali celebrates festivals all year so in order to observe festivals, September-October would be the best time because of the so-called festivals Dashain and Tihar in this months. So if you are planning to visit there take some advice with someone who’s been there a few years ago and knows about the climatic situation of Nepal.